There are a lot of business people who feel that the traditional business card will soon go the way of the Dodo bird. The rationale is that business cards will be replaced by “bumping” smart phones for an exchange of information. That is, using the iPhone application “Bump” in a kind of fist-bump move (with, say, an iPhone or Google Android in hand) to exchange contact information. Admittedly, it’s a pretty cool concept, but until it’s the norm rather than the exception for contact information exchange, assume that our beloved business cards will always find their way to our pockets (or at least our desk drawers). 1. Always Keep Some With You — You never know when a networking opportunity may spring up. A casual trip to the bank or running some errands could lead to a chance encounter with someone whose business might benefit you or your business. When such chance encounters happen, having a business card on hand makes information exchange seamless, as opposed to worrying about “Bumping” them or finding something to write your information down on. 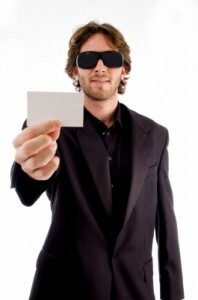 5. Business Cards Are An Active Tool — Business cards are a tool for active networking. There is always something going down in the business world, regardless of what kind of business you’re involved in. Therefore, seek out networking opportunities by checking online and keeping your ear to the ground, then get out to these events and start delivering your business cards with every handshake you make. 6. Follow Up After Handing Out — If you received a business card from someone you are interested in doing business with, use the exchange as a reason to conduct a follow-up phone call. If you don’t take initiative, you risk the chance of that prospect forgetting about you. For many, business cards tend to get easily lost among all the paperwork and miscellaneous paraphernalia that adorns their desk. As a result, it might be a long while before they get back to you — if they even do at all. Remember, for the serious businessperson, the business card has been and will no doubt remain an invaluable tool in their networking arsenal. Even with all the advances in communication the past two decades — mobile phones, text messaging, e-mail, online messengers — classics like the telephone and the business card remain the most recognizable, understood and direct means to connect with a prospect or potential businessperson.